In Germany as well as in Switzerland an increasing need for innovative technologies to develop “cities of the future” or Smart Cities due to global mega trends like demographic change, scarcity of resources and growing urbanisation is perceptible. 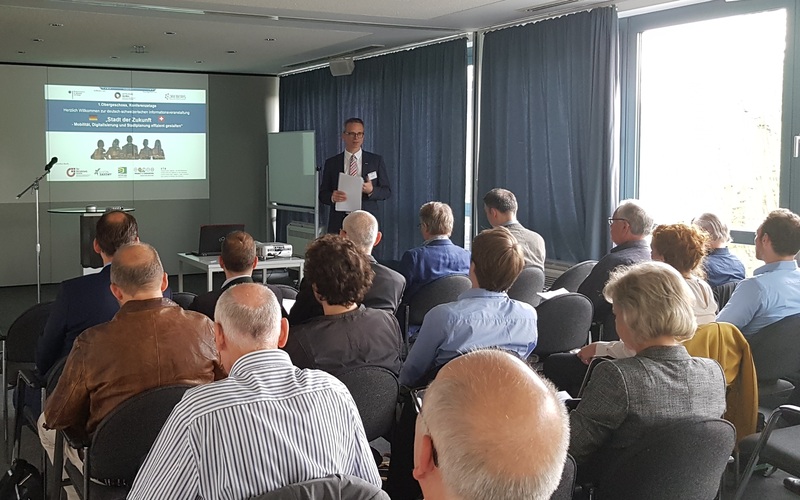 To foster German-Swiss co-operation and exchange in this sector, DREBERIS has organised an informational trip for Swiss sector representatives to Germany on behalf of the Federal Ministry for Economic Affairs and Technology (BMWi) from 23rd – 25th of April 2018. The Swiss delegation group had the chance to exchange ideas and knowledge about innovative, applied solutions with German small and medium-sized enterprises (SMEs), municipal authorities, universities and clusters. During our round trip from Dresden to Düsseldorf and Bottrop via Munich we learned and discussed about different Smart City approaches and strategies and were able to connect with German experts. We thank all our German and Swiss supporters and speakers participating in the diverse talks, company visits, and city tours that made this professional exchange and exciting event possible!